How will this Supreme Court nomination fight end? If you know, do tell. I have no idea. Anderson Cooper had the scoop at 8 p.m. ET: Ford "wants the FBI to investigate her allegations before talking to the Senate Judiciary Committee about it." All of a sudden, the prospect of a televised hearing on Monday seemed less likely. Attorney Lisa Banks, representing Ford, told Cooper that "there's no reason that we should have a public hearing on Monday... It's too important to be rushed through." "This is about the White House, POTUS, the president, they're the sponsor of the nominee," Chris Cuomo said. So will the FBI get involved? Cuomo: "This is the president's call. Will he make it?" >> THE LATEST: Senate Judiciary Chairman Chuck Grassley says "there is no reason for further delay" and "the invitation for Monday still stands..."
How much has America changed, really? Erick Erickson, one of Kavanaugh's staunchest defenders, tweeted on Tuesday night that people (Dems) are "willing to destroy an innocent man so they can keep killing kids. And that's exactly what this is about." And Fox's Laura Ingraham tweeted just before her 10 p.m. show: "Hey @ChuckGrassley, she won't testify. Get your senators together, and call the vote." Liberal commentators have been highlighting the Ford camp's new letter to Grassley, which said that "her worst fears have materialized." The letter said "she has been the target of vicious harassment and even death threats." The Ford family has had to "relocate..."
Tucker Carlson has been insinuating for months that men are the true victims of the #MeToo movement. He hit this theme again on Tuesday night, saying that Dems have already concluded that Kavanaugh is guilty. "How do they know for certain what happened 36 years ago? 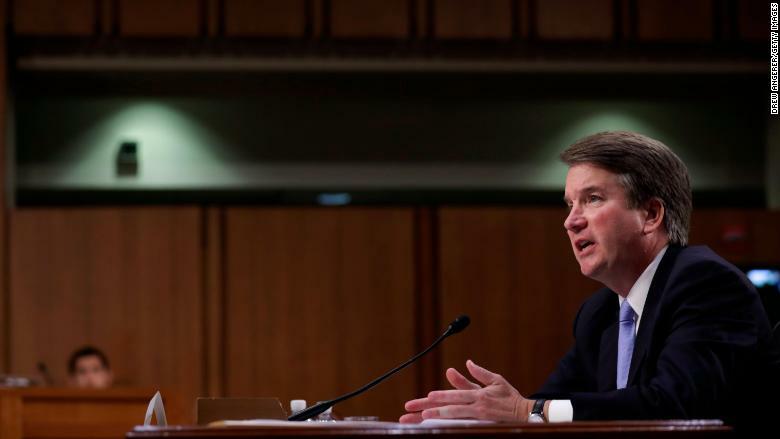 Because Brett Kavanaugh is a man and therefore he is guilty," he said. "All men are guilty. It's the Y chromosome." Does Carlson ever get tired of knocking down strawmen? Via CNN's Jim Acosta: "A source familiar with the matter said Judge Kavanaugh participated in a lengthy prep session today in the event that he does testify in a hearing to respond to the allegations from Dr. Ford. The session involved questions from White House officials peppering Kavanaugh about his personal life. The source acknowledged the preparation may not be necessary as the hearing is now up in the air..."
An Phung emails: The Beijing bureau chief of the LA Times, Jonathan Kaiman, was suspended in May amid sexual misconduct allegations. Now the paper says he has resigned, according to the NYT. Felicia Sonmez, one of Kaiman's accusers, said she was "grateful to The Los Angeles Times for taking her allegations seriously but added that 'several questions remained unanswered' about whether Mr. Kaiman was fired or resigned voluntarily." Reporter says his career has been "destroyed"
In a statement, Kaiman said everything that happened was consensual, and the allegations "have irrevocably destroyed my reputation, my professional network, my nine year career in journalism, and any hope for a rewarding career in the future; they have branded me with a scarlet letter for life, and driven me to the brink of suicide." "Fear" dropped one week ago. Simon & Schuster marked the occasion with a press release saying that it has sold more than 1.1 million copies so far. This total includes print copies, e-books, audiobooks, and "orders from consumers that are as yet unfulfilled due to extraordinary demand." A publisher's dream/nightmare! S&S says "these first week sales for 'Fear' were the largest for any title in Simon & Schuster company history." The company has "ordered a 10th printing of the book that when complete will bring the number of hardcover copies in print to more than 1,200,000..."
A couple weeks ago, CNN.com's preview of "Fear" had a "WARNING" at the top: "This story contains graphic language." On Tuesday, another book prompted another warning: CNN's Sara Sidner obtained an advance copy of Stormy Daniels' book and wrote this recap. The preface says "this story contains graphic sexual imagery." What? Rigging "The Apprentice" ?! Per Sidner's story: "In her book, Daniels says Trump offered to rig an appearance on 'The Apprentice' for her so she could stay on the show longer, saying he would try to get the show's challenges to her ahead of time. She says Trump's continuing promise to get her a spot on that reality show is why she kept taking his calls. When he finally admitted he couldn't get her on the show, she stopped taking his calls..."
Nellie Andreeva and Mike Fleming Jr.'s scoop for Deadline: "CBS Television Studios has won an auction and is in final negotiations for the rights to former FBI director James Comey's memoir." It will be "adapted into a miniseries that will be written by Oscar-nominated Captain Phillips scribe Billy Ray..."
>> KEY DETAIL: "Word is Comey flew in to Los Angeles for a series of pitch meetings with both film and TV (premium cable and streaming) buyers, which was held at CAA earlier this month..."
>> FLASHBACK: A few months ago, Comey said "I hope to be forgotten..."
-- Rahm Emanuel is writing a book, due out in 2020, titled "The Nation City: Why Mayors Run the World..."
Jill Disis emails: The next big experiment in journalism is underway. Civil, the blockchain company that wants to create a new model for journalism, launched its token sale on Tuesday. The cryptocurrency is a key part of the ambitious network of news organizations the company wants to support. Among them: The Colorado Sun, which was founded by a group of former Denver Post staffers earlier this summer. Civil told me in July that token owners are going to play a big role in keeping a check on newsrooms that are part of the community. All participants will abide by a journalistic code of ethics, and the community can leverage their tokens to challenge any content they believe runs afoul of the code. Tokens can also be used to tip journalists for their work.